Snoring is a vibratory noise created by disturbed airflow and the partial obstruction of the upper airway, typically either the nasal passage or the throat. If the airway becomes totally obstructed, it may lead to the disorder called sleep apnea. Snoring is very common, and there are many potential causes. This obstruction may be worsened by aging (including menopause), weight gain, alcohol consumption, and sleeping on your back. One potential cause, often present from birth or after nasal trauma, is something called a deviated septum. Ideally, the airway would be completely clear and air would move in and out without disruption. Unfortunately, sometimes this clear passage becomes partially blocked. This may be due to enlargement of the tonsils or adenoids, congestion in the nose, turbinate hypertrophy from allergies, excessive weight leading to a narrowed passage, or even a shift in the position of something called the nasal septum. The nose has tissue made of cartilage that separates the left and right nasal passageways. If you stick a finger in your nostril, you can feel this tissue called the nasal septum in the middle of the nose. Unfortunately, sometimes this tissue can be shifted to one side or the other. This blockage may be partial or complete. It is estimated that approximately 80 percent of people have a deviated septum. Many times this is simply present from birth due to a genetic, or congenital, influence. A high-arched hard palate may be associated. It may also occur as a result of trauma, such as a broken nose. This shift can cause partial obstruction of one of the nasal passages, leading to difficulty breathing on that side and snoring. The nose goes through something called a nasal cycle, meaning that airflow predominates on one side and then gradually shifts to the other over several hours. When it shifts to the side that is obstructed, nasal airflow becomes compromised and mouth breathing may be more likely to occur. This may contribute to dry mouth, snoring, and sleep apnea. Small deviations in the nasal septum may lead to no symptoms and may not require treatment. However, significant problems with breathing may result and treatment may be pursued. If breathing problems like snoring or sleep apnea occur, it may be necessary to have surgery called septoplasty. This involves moving the nasal septum back to the midline to open up the airways on each side. The cartilage is surgically broken and repositioned. It is allowed to heal gradually. Though the deviation may improve, it is possible for a more minor deviation to persist. This is often curative of the difficulties breathing, including any snoring that may have been present. 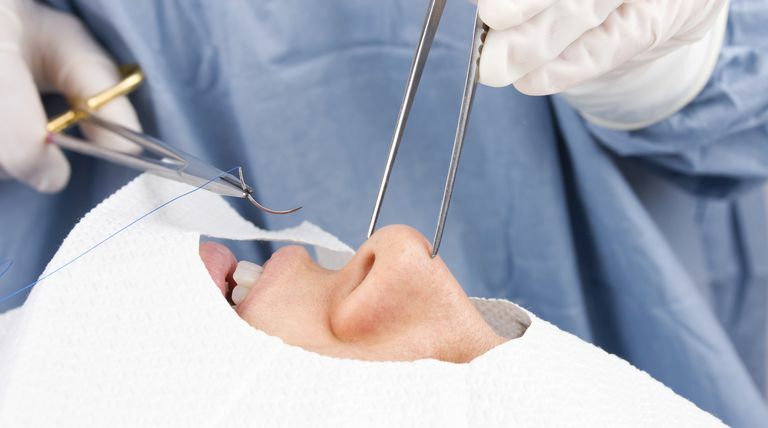 Septoplasty procedures are generally well-tolerated. It will be important to discuss coexisting medical disorders, medications, and risks with the surgeon. It is often done as an outpatient procedure, meaning that it is possible to go home the same day after waking from anesthesia. The surgery is often performed by an ear, nose, and throat (ENT) specialist or by a plastic surgeon. In most cases, recovery gradually occurs over days to weeks. It may take up to 1 year before the tissues have fully healed. Alternatives to surgery to treat snoring might include the use of external nasal strips, like Breathe Right strips, or the use of continuous positive airway pressure (CPAP) to treat sleep apnea. In some cases, the surgery may make it easier to tolerate CPAP therapy with a nasal mask. If the nasal obstruction interferes with CPAP use, a full-face mask may still be necessary. If you are concerned that you may have a deviated septum, it is important to visit your healthcare provider. After a careful examination of your nasal passageways with a device called a nasal speculum, you may be referred to a specialist and offered the possibility of surgery. This problem can often be treated successfully, with improvement in breathing both in sleep and during the day. Deviated septum. American Academy of Otolaryngology – Head and Neck Surgery. Snoring. National Institutes of Health.